Who are the Black Physicists? "Performance on the athletic field is easy to assess. A basketball goes in a hoop or it doesn't. In areas where performance is not based on the subjective interpretation of observers, African-Americans excel." --Sylvester Gates, University of Maryland Toll Professor of physics, in a Chemical and Engineering News feature story (July 21, 1998) about the challenges of fairly assessing academic talent in a not-yet-colorblind world. Francis K. A. Allotey - received the Prince Philip Gold Medal Award for his Soft X-Ray Spectroscopy known as "Allotey Formalism"
Alexander Animalu - early Nigerian Ph.D.
Herman Branson - cheated out of a piece of the Nobel Prize? 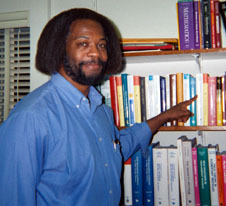 Sylvester James Gates - first winner of the Americal Physical Society's Bouchet Award. Meredith Gourdine - averaging a patent a year since 1971 including the Focus Flow Heat Sink, used for computer chip cooling. Francis Mensah - Ph.d. from University of Benin will get a second from Howard U.
Robert Johnson Omohundro - 40 papers, 2 patents no Ph.D.
Arlie Petters - against gravity in 8 years, from MIT Ph.D. to Princeton professor to a named chair at Duke U.
Mesgun Sebhatu - from Eritrea now in the U.S.
Dereje Seifu - from Ethiopia now in the U.S.
Demetrius D. Venable - Chair of Physics at Howard U.
Arthur BC Walker - famed solar physicist and x-ray astronomer. Chaired the presidential commission that investigated the 1986 space shuttle Challenger disaster. James E. Young - Professor Emeritus of Physics at the Massachusetts Institute of Technology; thesis advisor of Sylvester James Gates and Shirley Ann Jackson! 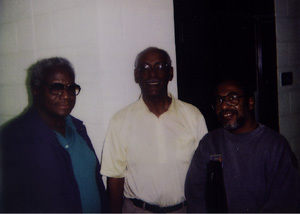 .I dedicate this web site to two of my Physics teachers, Dr. Herman Branson and Dr. Julius Taylor. I wish to thank three major contributors of information to this web site, Robert Fikes, Jr. of San Diego University and Dr. Hakeem M. Oluseyi of Lawrence Berkeley National Laboratory, and Dr. Ronald E. Mickens of Atlanta University, and since 2000, Roger Guibinga. Diop, The African Origin of Civilization: Myth or Reality, Lawrence Hill and Co., Westport. Presence Africaine, Paris, 1967. Mickens, The African American Presence in Physics,. Van Sertima, Blacks in Science, Transactions Books, 1983. p. 258-262.